The first cryo knife with a diamond platform, guarantees the best possible sectioning for sucrose infiltrated samples (Tokuyasu). The diamond platform guarantees an easy and gentle section pick-up. 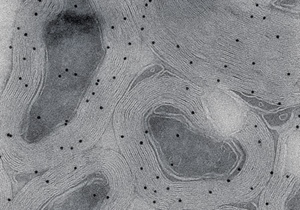 The sections are collected directly from the diamond surface using a loop and a sucrose/methyl-cellulose droplet (W. Liou et al., Histochemistry and Cell Biology, Vol. 106, pp. 41 – 55, 1996. P. J. Peters et al., Current Protocols in Cell Biology, pp. 4.7.1 – 4.7.18, 2006). The 35° angle leads to a considerable reduction in mechanical stresses and therefore to improved structure preservation in sucrose infiltrated samples (E. Bos et al., Journal of Structural Biology 175, pp. 62 – 72, 2011). 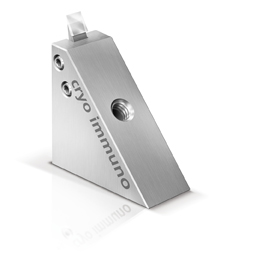 We recommend the cryo immuno knife also for sectioning frozen hydrated samples (CEMOVIS). The 35° angle is a good compromise between durability and cutting performance (A. Al-Amoudi et al., Journal of Structural Biology 150, pp. 109 – 121, 2005). Mouse optic nerve, immunolabeling of the major myelin protein proteolipid protein (PLP), 10 nm gold. Wiebke Möbius, Dept. of Neurogenetics, EM Core Facility, MPI of Experimental Medicine, Göttingen.